One of our own is a finalist for “Best of The Web” Awards! 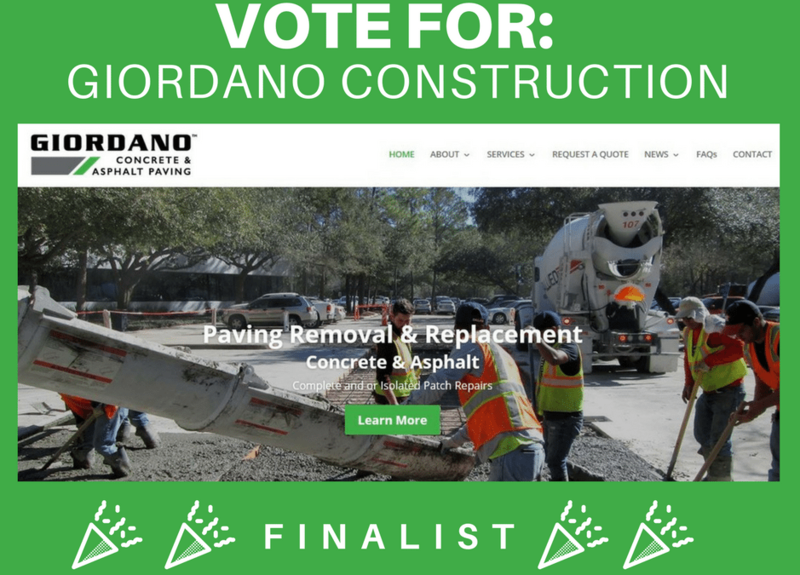 We are happy to announce that our client, Giordano Construction Inc. is a finalist in the Pavement Maintenance & Reconstruction’s 2018 “Best of the Web” Awards! Our client, Giordano Construction is a full-service concrete and asphalt paving company specializing in the removal and replacement of said materials. When Giordano Construction first contacted us, their website was outdated and unprofessional-looking. Our primary objective was to implement a rebranding campaign to target their right audience, and to increase the number of inquiries by 15% from their website by the end of the year. We devised a plan that utilized Giordano Construction’s goal. Communicating frequently amongst ourselves and them, we contributed new ideas that would improve their branding. 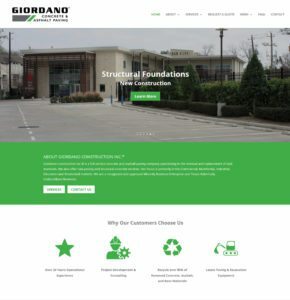 Giordano Construction’s new website, is designed to be organized and minimal. This website is an outstanding example where aesthetics meets usability. We incorporated green in their website and logo to signify that they are environmentally friendly. From brand consistency, rich content, and graphics; their clients and visitors can experience a clear message, learn about the company, their process, their projects, and their client’s testimonials. Their services and contact information are at the forefront of the website, therefore we included a brief about section that leads to these individual pages. Large-scale images were used to display the hard work Giordano and their employees have done, conveying their dependability and dedication to each project they undertake. All the hard work paid off! The new website release, enhanced their online presence and within two months of updating their site, they were given a project that brought in over $60k. Now we need your help! The winner will be announced on February 7-10! You have until this day to vote for them. Please follow this link to help Giordano Construction’s website make it to the top!